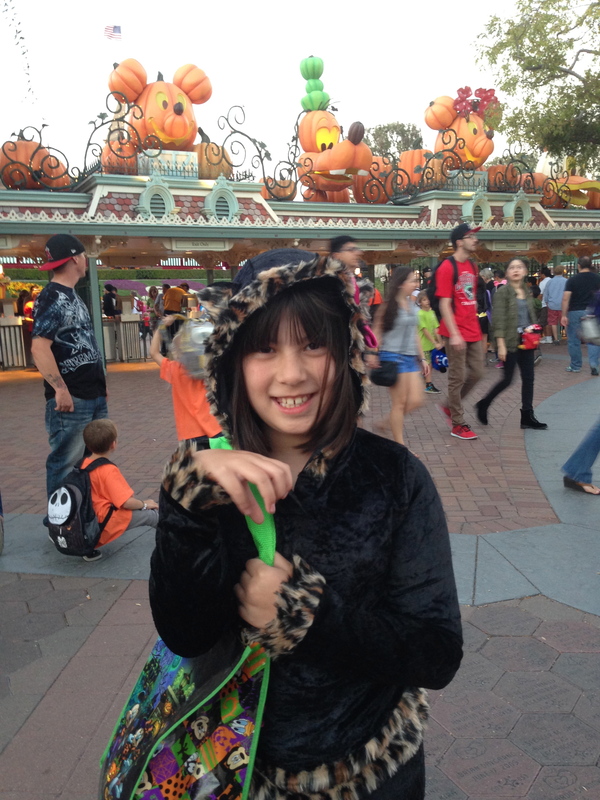 Halloween Time at Disneyland is Rockin’ and so is Mickey’s Halloween Party! About to enter into Mickey’s Halloween Party for some great fun! What could be more appropriate than spreading a little Disney magic on a night celebrating the supernatural? If you’ve never been to Mickey’s Halloween Party at Disneyland, you need to make time to attend this fun-filled treat of an event. But hurry! This is one popular party and if it’s like last year, they will sell out. And why wouldn’t it be? 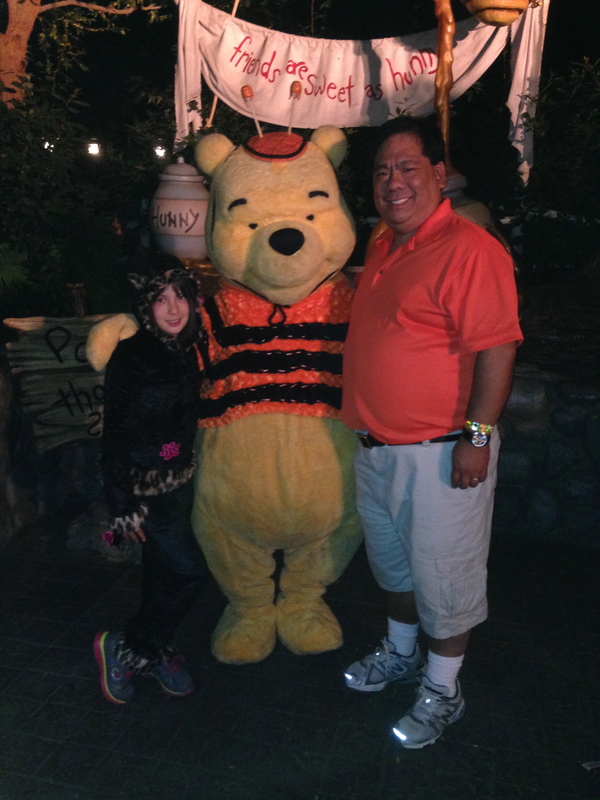 This private admission party gives you the best of Disney and Halloween all lumped together. If the trick-or-treat candy isn’t enough for you, there’s always Halloween-themed cookies and caramel apples available for your taste buds. For something more substantial, you can find great eats around the park. Last year they had a Monster U Burger at Tomorrowland Terrace and a Monster Mac N Cheese Pizza at Redd Rocket’s Pizza Port. Character opportunity pictures with your favorites are available all over the park. Want a picture with your favorite characters? Look at the schedule printed on your guide and not only will it show you where all the treat stations are, but also where you can find your photo ops! There are quite a few places to get your photo taken. One of the most popular was Jack Skellington right in New Orleans Square. The host of the Haunted Mansion Holiday attraction is a cult favorite, but BEWARE the lines can become quite long! You can also find other Disney characters posing for pics. The Disney villains are out in force and you can also find loveable characters like Pooh Bear dressed up in their favorite Halloween costumes. And there is PLENTY of trick-or-treating! Although no “tricks” here at the Happiest Place on Earth, the treats are quite good. We got everything from M&M’s, Nestle Crunch, Milky Way, Snickers, and Reese’s Peanut Butter Cups to weird and unusual treats like Kettle Brand Potato Chips, Kid CLIF bars, and Craisins. Often you could even choose between healthy and not-so-healthy options. And of course, Disney gives you a treat bag as part of your ticket in, although they do have holiday-themed treat bags to be purchased right up front at the Disney Showcase. There are stations set up around the park for your enjoyment so that no matter where you are, you can get your fill. And there is no limit to how often you can go back. The one ride that is completely full! 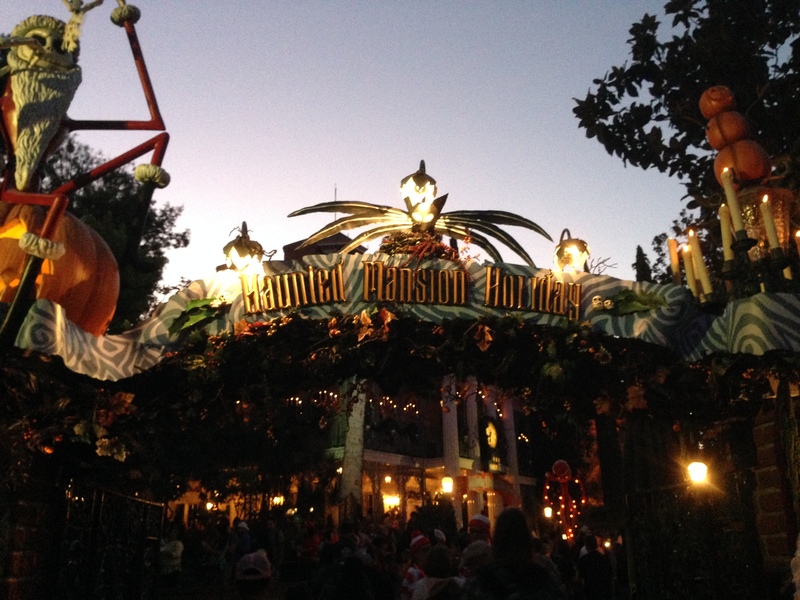 The popular annual return of Haunted Mansion Holiday. But save time for the attractions. Most rides are open all night long. We were able to go on Splash Mountain with no wait at all. Same for some of the other rides – Star Tours was only a five minute wait. A couple of the featured rides – Haunted Mansion Holiday and Space Mountain: Ghost Galaxy – had longer lines (especially Haunted Mansion Holiday) but otherwise, it was a great night to go on the rides you loved. You can cover more of the park in the limited amount of time of the party than you probably could on a normal day at Disneyland! And if that wasn’t enough, they also have a special fireworks show just for the party people. So what are you waiting for? Go buy your tickets today! For tips about how to make the most of your Halloween party experience, read about it here! Hope u guys are okay from the fire! Thanks! We are doing great. Just having to live in temporary housing for the next couple of months, but all of us are safe. Lost my daughter’s collection of Minnie Mouse dolls and most of our stuff is getting lost to soot, smoke, and asbestos – but otherwise, we are happy and healthy. As long as you all are safe and sound, that’s what matters.